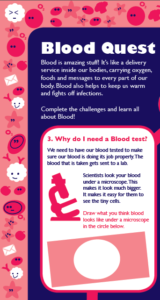 Bloodquest is a preparation tool to help prepare children for blood tests by helping them to find out about blood and what happens during a blood test. It was developed in conjunction with children and designed to be fun and informative. 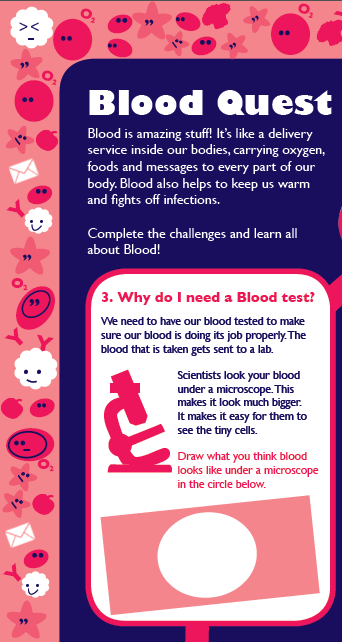 The paper version of Bloodquest was developed by researchers in the Centre for Outcomes and Experience Research in Children’s Health, Illness and Disability (ORCHID) at Great Ormond Street Hospital, and funded by Roald Dahl’s Marvellous Children’s Charity and the Burdett Trust for Nursing. The Blood Quest app is an interactive digital tool built on the outcomes of a collaborative research study led by the Centre for Outcomes and Experience Research in Children’s Health, Illness and Disability (ORCHID) and GO Create! Arts Programme at Great Ormond Street Hospital. It was generously funded by Roald Dahl’s Marvellous Children’s Charity, Burdett Trust for Nursing and Great Ormond Street Hospital Children’s Charity’.